Sweden striker Zlatan Ibrahimovic says Premier League clubs are interested in signing him from French champions Paris St-Germain. The 34-year-old, who is out of contract in the summer, has been linked with Manchester United, Chelsea and Arsenal. "There has been interest and we will see where it leads," he said. "But it would have to be like a marriage, both sides have to want it as much." 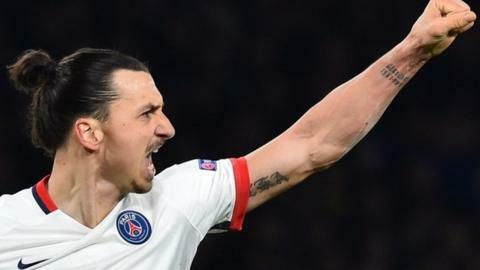 Ibrahimovic has won league titles in four European countries. After helping Ajax win two Dutch titles at the start of the century, he won two Serie A championships with Juventus - both later revoked because of the Calciopoli scandal - and three more with Inter Milan. He then moved to Spain and claimed the La Liga title with Barcelona before returning to Italy to win the 2010-11 Serie A with AC Milan - his eighth successive league title. After a season without silverware at Milan in 2011-12, Ibrahimovic moved to PSG, and the French side have won the past four Ligue 1 titles. After scoring four goals in a 9-0 thrashing of Troyes earlier this month to seal this year's title, Ibrahimovic said: "For the moment, I will not be at PSG next season. I still have a month and a half left here. Ibrahimovic has scored 62 international goals in 111 appearances, including a sensational 30-yard overhead bicycle kick in a 4-2 friendly win over England in 2012.